These adorable 9 squares may be hung together to make a wood 2' x 2' quilt. 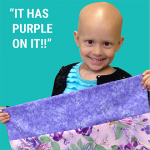 To be part of this Mystery Quilt, you need to purchase a Brown Bag kit with the fabric. Come in every couple weeks to collect the next set of cutting instructions. It's baaaack!! This fun quilt program created by Karen Montgomery was very popular last year. Kits are available online or in our shop. Learn the tips and tricks to making the Star Illusions quilt- Great Beginner class! Have you been struggling to get your tension set right? Capi could talk all day about tension, but we made her stick to two hours. A variety of quick serger projects- six to choose from. You know how to use your Serger, now learn to do the fun stuff. Join Cindy's class to share and encourage each other through this fun, spring-like quilt. This is a student lead, facilitator backed class on using the Pro-Stitcher. Choose from one of the many tablerunner patterns to make your own. Janome Monthly Club for Embroidery Enthusiasts. Sign up for the rest of the Embroidery Club Series and get one month free. Learn to use innovative new designs with this new series of rulers. A perfect organizer for your desk or sewing table. Design your own fabric with paints, inks, pens, crayons, stencils and gel plates. Jamie has another idea for a folding reversible basket. This pouch lies flat when not in use but explodes when you start filling it up with whatever your heart desires. Choose 1 of 3 different stockings to knit. Choose 1 of 3 Christmas Stockings to make. Drop in for help with knitting on all your projects. All skill levels are welcome. Is YouTube not quite showing you how to make that tricky stitch? Janet will. Don't be scared off from making a Dresden Plate! This is a stunning quilt project for an experienced quilter. Join us monthly or jump in anytime as we make a charming appliqued quilt or table toppers or wall hangings. And you'll get a sweet treat! Every class includes a sweet snack made personally by Kathy. Join this year long Machine Embroidery Club featuring designs and innovative projects by Kimberbell. Come join us and work on a Kimberbell exclusive design. Each month for 12 months will be a different design that you can get through the club. Does your patriotic heart beat red, white, and blue? Mine too! We love all the fanfare?Main Street parades, rodeos, family picnics, and fireworks after dark. This event is one we have been waiting for. Make cute things for the kitchen, or hostess gifts. 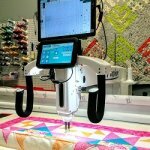 Learn to operate the Handi Quilter Long Arm quilting machine. Learn how to operate our long arm machine in order to rent it. Once you take our Long Arm 101, you may rent the long arm for 5 hour sessions. Keeping Christmas alive all year long! Join us to cross-stitch or embroidery. All are welcome! One on one instruction on your new machine. Learn how to use your new machine. Class fee is refunded after you attend your class. Classes are free with the purchase of a machine from our store. Not your typical Block the Month, it;s so much more. Learn about color, many different techniques, with multiple project possibilities. Have you met the Studio 180 rulers? They are excellent for left and right handed quilters. Make many different blocks & see what you can make! Have you seen the patterns in other languages and wanted to try them? Learn an easy way to decorate tumblers with your favorite fabric. Use your regular sewing machine to do free motion quilting. This all day workshop with fabric designer Toni Steere is sure to be full of great tips and techniques for all levels of sewists. Meet the fabric designer & pattern writer! This all day workshop with fabric & pattern designer Toni Steere will bring batiks to a new dimension! Learn to watercolor paint with Gayle Jones. Gayle leads you through the steps in such a way that both fun and successful. Learn to paint with watercolors while you paint this perky little hummingbird just in time for Spring.